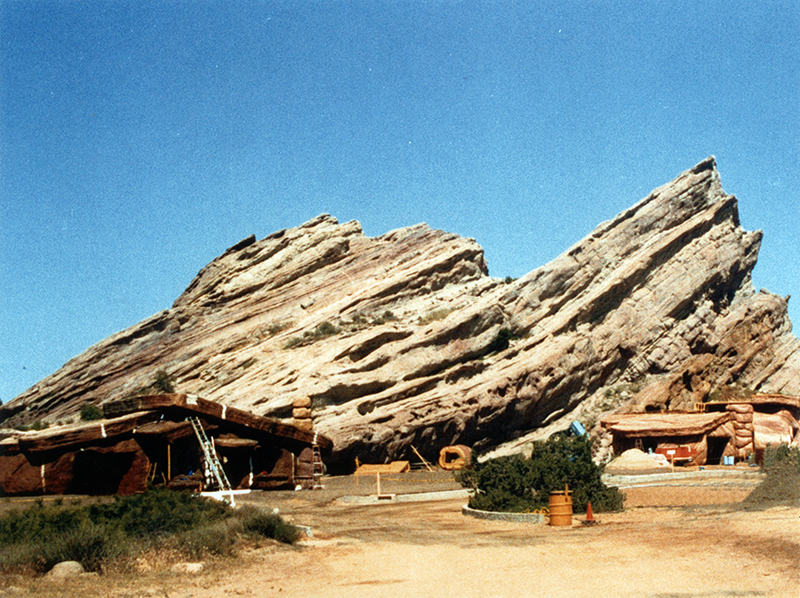 SCVHistory.com LW3350 | Vasquez Rocks | 'The Flintstones' (Universal 1994) in Production, 1993. 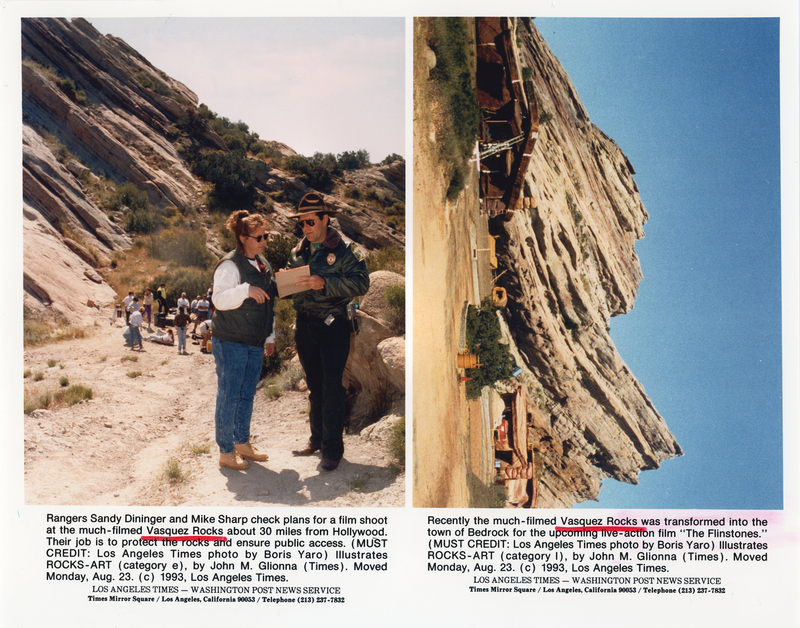 "The Flintstones" (Unversal 1994) in production at Vasquez Rocks County Park, August 1993. 8x10 glossy news photo (2) from Los Angeles Times-Washington Post News Service. This print from the archive of the Houston Chronicle. Photos by three-time Pulitzer prize-winning (team coverage) L.A. Times photographer Boris Yaro, who is perhaps best known for his 1968 photograph of Sen. Robert F. Kennedy lying on the floor of the Ambassador Hotel (still alive), moments after he'd been shot in the head. Yaro also grabbed Sirhan Sirhan's gun from the floor when he dropped it as he was being tackled by police and was reaching for it. 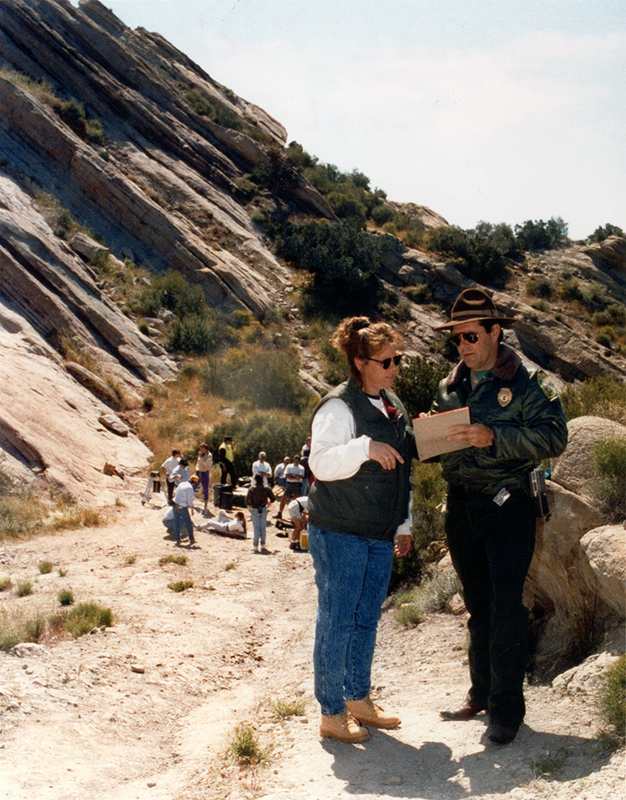 Rangers Sandy Dininger and Mike Sharp check plans for a film shoot at the much-filmed Vasquez Rocks about 30 miles from Hollywood. Their job is to protect the rocks and ensure public access. MUST CREDIT: Los Angeles Times photo by Boris Yaro; Illustrates ROCKS-ART (category e), by John M. Glionna (Times). Moved Monday, Aug. 23 (c)1993, Los Angeles Times. Recently the much-filmed Vasquez Rocks was transformed into the town of Bedrock for the upcoming live action film, "The Flintstones." Yabba Dabba Doo! Moviegoers are accustomed to seeing cowboys ride and spaceships land at Vasquez Rocks — so it was unusual to see the rocks revert to caveman days for the 1994 Universal picture, "The Flintstones." Anyway, it cost about $45 million to make "The Flintstones" — a few clams more than Hal Roach spent in 1940 — and another $83 million to produce the sequel, "The Flintstones in Viva Rock Vegas" (Universal 2000), also shot at the rocks. The first version had bigger names in the cast: John Goodman as Fred Flintstone and Elizabeth Perkins as his wife, Wilma; Rick Moranis as	Barney Rubble and Rosie O'Donnell as his wife, Betty Rubble. Also featured were Kyle MacLachlan, Halle Berry, Elizabeth Taylor, Dann Florek, Richard Moll, Irwin Keyes, Jonathan Winters and Harvey Korman, with twins Elaine and Melanie Silver playing	Pebbles and Hlynur Sigurðsson as	Bamm-Bamm. Filming took place from May 17 to August 20, 1993. Released May 27, 1994, "The Flinstones" was directed by Brian Levant ("Mork & Mindy," "Happy Days") and produced by Universal Pictures, Amblin Entertainment and Hanna-Barbera Productions. LW3350: 9600 dpi jpeg from original photograph purchased 2018 by Leon Worden.